The B-58A was the only version of the B-58 Hustler built, along with a small number of TB-58A conversion trainers. Both types were powered by the General Electric J79 engine (the same engine used on the Lockheed F-104 Starfighter and the McDonnell F-4 Phantom II) and other than some minor differences in the cockpits, were essentially identical externally. 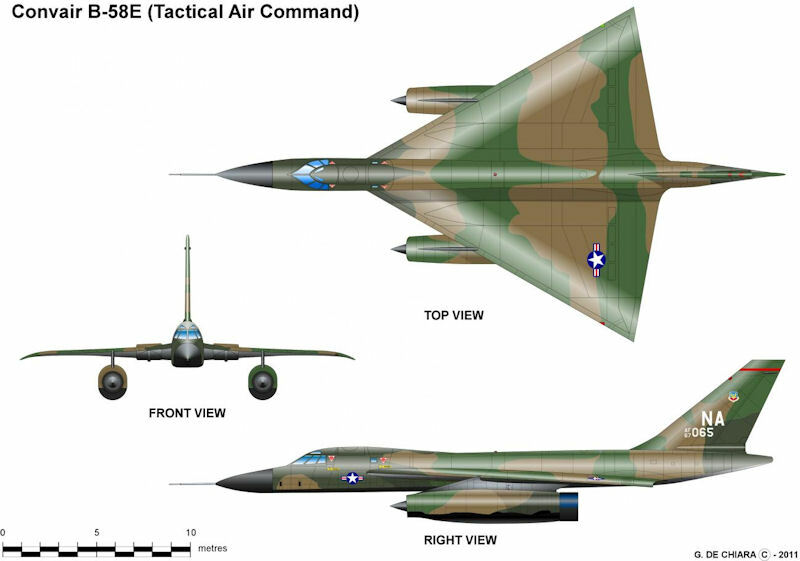 Since the proposed B-58B never flew, most of the time the aircraft were simply referred to as "B-58" or "TB-58". Hustlers fitted with the LA-331 reconnaissance pod were designated "RB-58" or "RB-58A". It seems that RB-58As also carried some specialized equipment to control the pod and support the reconnaissance mission. B-58s were used in limited numbers as test aircraft. One particularly impressive test configuration involved the fit of the huge YJ93 engine for the North American XB-70 bomber to the third B-58 built, replacing the aircraft's weapons pod. This aircraft was designated the "NB-58A". The flight characteristics peculiar to delta-wing planforms and the B-58's unmatched high speed called for a trainer version of the new bomber. The Air Force first authorized the conversion of 4 early test B-58As to the training configuration on 25 February 1959. The modification, done under production contract AF33(600)-36200, provided side-by-side seating for pilot training, with the instructor placed aft and 10 degrees right of the student. The Air Force took delivery of the first TB-58A in August 1960, and subsequently ordered the conversion of 4 additional test B-58As to a similar configuration. This last lot was modified under special contract, but the costs were lumped together for a total of almost $16 million. The an "RB-58" was a rare bird and differed only the carriage of special equipment to allow it to use a reconnaissance version of the weapons pod carried by the Hustler. The early photo reconnaissance pod program, due to transform the B-58 into a high-altitude and speedy reconnaissance weapon system had been cancelled, reinstated, and again cancelled by December 1958. One pod, delivered in June 1958, was lost as the plane it equipped crashed in June 1960. The electromagnetic reconnaissance program followed the same pattern, being cancelled in October 1957, then reendorsed, and finally abandoned in May 1958, after delivery of two pods. In 1963, another change took place. As a result of the October 1962 Cuban Crisis, SAC decided the B-58A could be used to great advantage for low-level, highspeed photographic reconnaissance. This was based on the assumption that the extra task could be carried out without making a reconnaissance aircraft out of the few available B-58As. After rejection of several unsatisfactory proposals, a solution was found. It simply involved the incorporation of a KA-56 panoramic camera into the nose fairing of the MB-1 pod. Approved by the Air Staff in mid-1963, the modification was successfully flight tested on 30 October and 10 cameras and associated equipment were purchased. Known as Project Mainline, the modification of 44 B-58As and 10 MB-1 pods was completed on 6 December at a cost of approximately $1 million. The proposed B-58B would have introduced a host of improvements over the production B-58A, but the USAF never went ahead with development. The B-58B was a slightly enlarged and significantly more powerful design proposed by Convair as a follow-on to the B-58A. The B-58B was to be powered by four General Electric J79-GE-9 turbojets, with considerably greater thrust than the J79-GE-5Bs of the B-58A. The B-58B would have been significantly longer than the B-58A, with an extra structural section inserted in the fuselage. The B-58B also had some aerodynamic refinements, with extensions being added to the inboard leading edges of the delta wing, which would have improved the handling characteristics at high angles of attack. The most significant difference between the B-58B and the B-58A was the B-58B's greater range of weapons compared with the B-58A. In particular, the B-58B was to have a significant conventional weapons capability, which the B-58A did not have. This was made possible by fitting a new and significantly larger underfuselage pod capable of carrying more fuel, plus the ability to carry a set of conventional iron bombs in an internal bay. In addition, a pair of air-launched ballistic missiles could carried on underwing pylons just outboard of the centerline pod. Alternatively, an extra pair of fuel tanks could be carried on these underwing pylons. B-58A serial number 55-0668 was to have been converted as the B-58B prototype, but the B-58B project was cancelled before anything could be completed. The B-58C, or BJ-58, was proposed as an enlarged version of the B-58A to be powered by Pratt & Whitney J58 turbojet engines. The 32,500-thrust J58 was the same engine used on the Lockheed SR-71. Design studies were conducted with two and four engine designs. The C model had an estimated top speed approaching Mach 3, a supersonic cruise capability of approximately Mach 2, and a service ceiling of about 70,000 feet. The B-58C was proposed as a lower cost alternative to the North American XB-70 or as a medium bomber to fill the gap between the XB-70 and the XF-108 Rapier Mach 3 fighter (proposal). The C model would have been capable of carrying a more varied assortment of weapons, including conventional bombs. 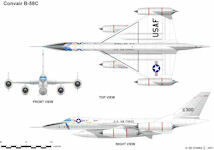 The B-58C was proposed as a lower cost alternative to the North American XB-70. Following the B-58B proposal came the B-58C proposal which swapped out the J79 engines for more powerful Pratt and Whitney J58 32,500 lbf (145 kN) engines (the same engines as used on the Lockheed SR-71 Blackbird). The outboard nacelles were moved to the wingtips and sported two diagonal stabilizing fins. Studies were conducted with two and four engine designs. Convair estimated the B-58C to be capable of Mach 3, but the USAF was absorbing significant costs in getting the B-58A operational with the Strategic Air Command and its development never proceeded. This model of the B-58, designated B-J/58 by Convair, but known unofficially by the Air Force as the B-58C, incorporated significant airframe modifications, including a new wing leading edge, more tail area, a 5-foot fuselage extension, and 4 Pratt & Whitney J58 engines without afterburners. Convair estimated maximum range at 5,200 nautical miles, but the USAF disputed this figure as a gross exaggeration. In 1960 Convair estimated that its all-supersonic, Mach 2.4 B-58C would be as efficient and much cheaper than the B-70. The Air Force did not test these propositions for several reasons. Even if the proposed airplane approached the B-70's anticipated performance, it had neither the payload nor the growth potential of the latter. 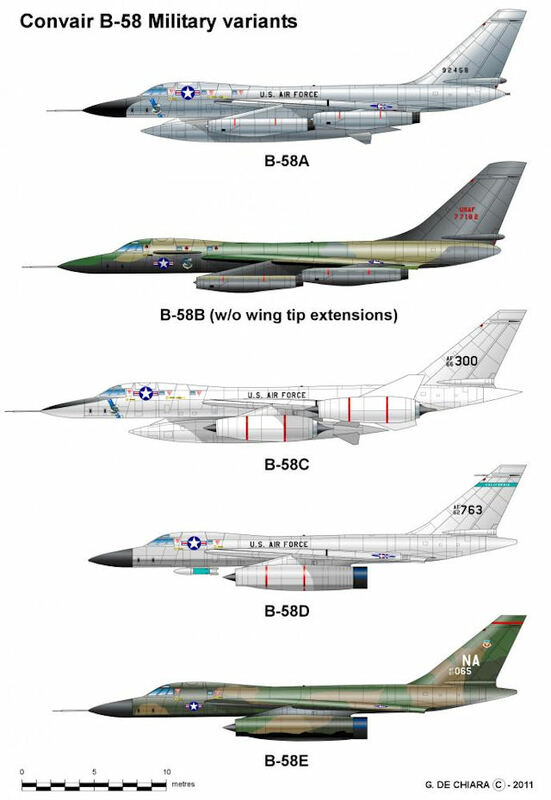 The B-70 was the beginning of a design, the B-58C would be the ultimate product of an old configuration. Further study of the Convair proposal practically closed the case. In April 1960, ARDC reported that the contractor's estimate of a 5,200-nautical mile unrefueled range was probably 25 percent too optimistic. Also, extensive use of aluminum in the B-58C could create problems since the effects of this metal's exposure to high temperatures (aerodynamic heat) was not known. Lack of funds prompted the final decision. Greatly concerned with the B-70, recently confined to development status, the Air Staff as well as SAC did not want to risk the financial interference of a new project. As enemy defenses against high-speed, high-altitude penetration bombers improved, the value of the B-58C diminished and the program was cancelled in early 1961. In early 1961, the Kennedy Administration asked the Congress to cancel production of the "unnecessary and economically unjustifiable" B-70 Valkyrie. Thereupon, the B-70 funds were reduced and the program was limited to 3 experimental planes. In late April, Convair was informed that the Air Force had no interest in the B-58C. The J58-powered B-58C became the basis for a family SST designs, starting with the Model RC-80 (ostensibly some sort of pseudo-MDS designation) for a supersonic VIP transport that could also perform other roles, such as reconnaissance. Like the B-58A and the B-58C, it had a large fuel pod under the fuselage, but it didn't carry a nuclear payload, it only carried fuel. 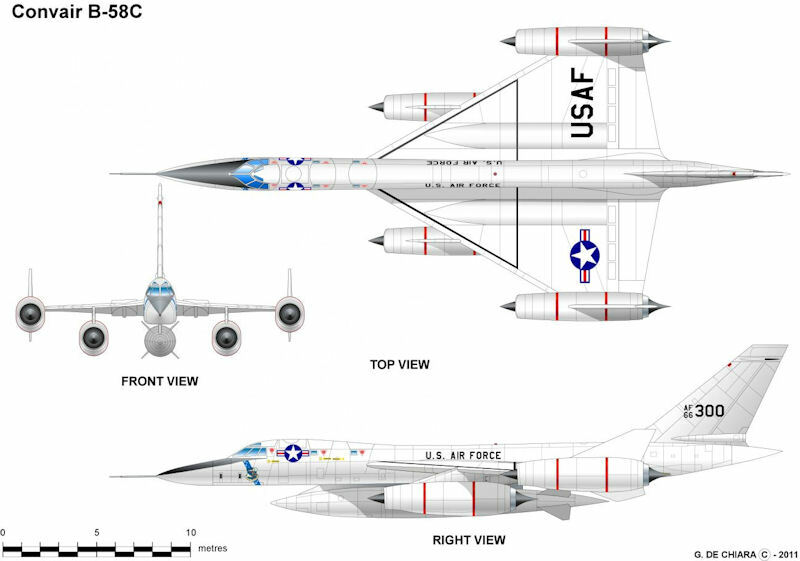 As the fuselage was longer, the design had a conventional horizontal tailplane with marked anhedral but the wings and engines were otherwise identical to the B-58C in size and layout. Jay Miller's book about B-58 (Aerofax publishers) at page 145 provides a clear 3-views of the B-58D/E version. Joe Baugher relates that "There have been persistent rumors that B-58D and E Hustler versions were planned, but there is no evidence that such designations were ever officially allocated by the USAF. In addition, even if there were such designations issued, it is not at all clear what kind of aircraft to which these designations refer. Drawings of a Hustler variant powered by a pair of Pratt & Whitney J58 turbojets have been seen, but it is not certain if these represent either the B-58D or E. There was also some thought of a Hustler version powered by four Pratt & Whitney J75 turbojets and equipped with downward-folding wingtips. Again, it is uncertain if this aircraft is the B-58D or E, or perhaps some other paper project." It is said that the B-58D was to be a long range interceptor for ADC. Two seats and two engines (J-58 with A/B) smaller version of B-58C. Equipped with radar and missiles (perhaps Genie and Falcon). The B-58E appears to be the multi-mission platform offered to TAC, not the interceptor offred to ADC. Jay Miller's book about B-58 (Aerofax publishers) at page 145 describes the B-58E as a Tactical Bomber. During the early 1950's the idea of equipping fighter-bombers with atomic weapons against purely tactical targets came to be accepted. The Air Force argued that tactical fighter bombers — using the new low-altitude bombing system (LABS) - could achieve accuracy equal to that of artillery. By the mid-1950s the old distinction between tactical and strategic weapons was fast disappearing and even the differences between tactical and strategic air forces were being questioned. Throughout the late 1950s, the United States was committed to increasing nuclear weapons quantities to enhance flexibility in the types of nuclear-capable military delivery vehicles and the bombs and warheads available for delivery. Throughout most of the 1950s, President Eisenhower's heavy reliance on a deterrent policy of "massive retaliation" led to an em- phasis on specialized strategic and tactical nuclear missions for the armed forces. 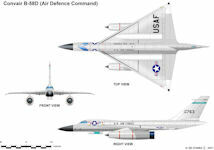 The Air Force sought fighters and bombers designed to operate in a theater or strategic nuclear environment, in support of offensive nuclear operations or defending against enemy strategic nuclear attack. By 1960, with costs skyrocketing, defense planners realized that the large number of full-scale development and prototype technology- demonstration programs characteristic of the 1950s could no longer be financially sustained. Following the election of President Kennedy, however, Secretary McNamara sought to combine these replacement requirements-minus CAS-into a single aircraft, as reflected in the TFX RFP issued in September 1961. 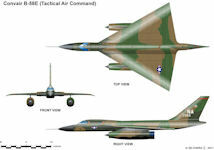 Calling for a 60,000 lb gross takeoff weight and low-level supersonic dash capability for the delivery of nuclear and conventional weapons, the TFX requirement asked for a large multirole fighter-bomber in the same weight class as medium bombers, such as the B-57 and B-66.